Quantum fluids may mix in very weird ways, according to new computer simulations of exotic states of matter known as Bose-Einstein condensates (BECs). Far in the future, BECs may enable new kinds of ultra-fast computers. But for now, researchers are just trying to understand the basic physics of how they work. That's what an Ohio State University visiting scholar in the Department of Physics, Kui-Tian Xi, and his colleagues were doing when they used a supercomputer to simulate what would happen if someone mixed two magnetically polarized BECs. 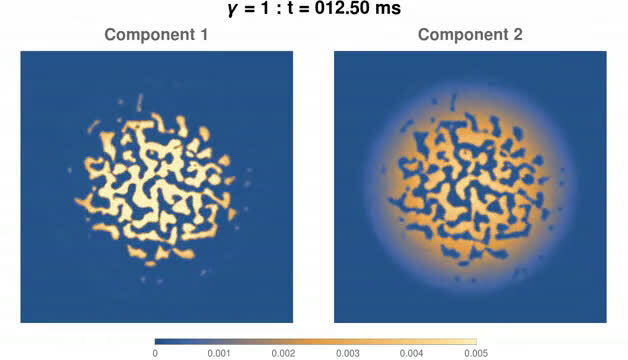 Snapshots from the simulations, published in the journal Physical Review A, resemble ink blot tests that can be interpreted in any number of ways. As one fluid percolated up through the other, Xi first saw the blobs form a turtle (that is, a pattern with six finger-like shapes that looked like a head, tail and four legs, similar to a turtle), then a frog (back legs akimbo) and finally an explosion of mushroom shapes. It might not have been exactly what he expected, but Xi said he wasn't all that surprised, either. "To be honest, I did expect that I may see some interesting dynamical properties. But when I first saw the turtle, I thought I might have calculated the parameters of the simulation wrong," he said. "Then I realized there might be some kind of instability at the interface of the fluids, just like those of classical fluids." Bose Einstein Condensates are gases made of atoms that are so cold, all of their motion nearly ceases. As the Indian physicist Satyendra Nath Bose and Albert Einstein predicted in the 1920s—and experiments eventually proved in the 1990s—BECs display strange properties because all the atoms occupy the same quantum state. As such, BECs are superfluids. They are supposed to be frictionless, so they should flow together with zero viscosity. Yet, when Xi adjusted parameters of the simulation, such as the strength of the magnetic interactions, the two fluids mixed as if one was more viscous than the other—the way viscous hot wax bobs through less viscous water inside a lava lamp. 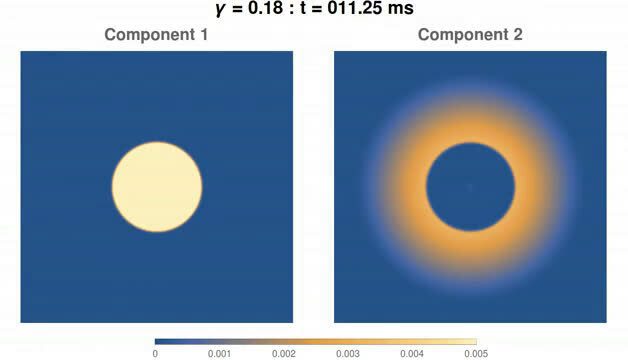 Xi and his colleagues, including Hiroki Saito, study leader and professor of engineering science at the University of Electro-Communications in Japan, believe that the simulations offer clues to phenomena that physicists have seen in actual experiments. Under certain circumstances, BECs do seem to behave like normal matter. In particular, Xi points to recent numerical simulations at Newcastle University where another superfluid, liquid helium, formed waves of turbulence as it flowed over the rough surface of a wire. The cause of the strange simulated BEC behavior remains to be seen, but Xi said that current technology would allow experimental physicists to conduct the experiment for real. As a theorist, though, he's going to focus on the possible implications of an increasing connection between the behavior of quantum and classical fluids.